I'm still not feeling all that great about life or running or anything, so I decided to seek out some sources of inspiration and motivation, specifically as it applies to running. Running was, until recently, my happy place, so I want to get back to that. I'm hoping that taking a moment to acknowledge some good, exciting, or fun things may help me get back to a happier place in my life, I've decided to reinstate Friday Favorites. So here are my favorite things that I'm using as a source of inspiration and motivation. The Believe Training Journal by Lauren Fleshman and Roisin McGettigan-Dumas. I bought the training journal to serve as both a training tool and a source of inspiration. In addition to offering a place to log workouts and training, it also offers tips and advice and is packed with useful information. My copy of Runner's World arrived yesterday. I'll be reading it cover to cover over the next couple of days in search of any small nugget of inspiration that can help motivate me to get back on track. The Shamrock Shuffle is this weekend. I was really excited when I first signed up for the race many many many months ago. Now...yeah...I'm not feeling it. But I do have to admit that I got a little thrill when getting my bib number and shirt. Although I'll most likely be using it as a training run and not really racing it, I think the energy from the crowd of runners may help lift my spirits on Sunday. Motivational posters for runners. Yes, it is a thing. Runner's World has a whole slide show set up on their website, which I recently turned to in search of some motivation this week. 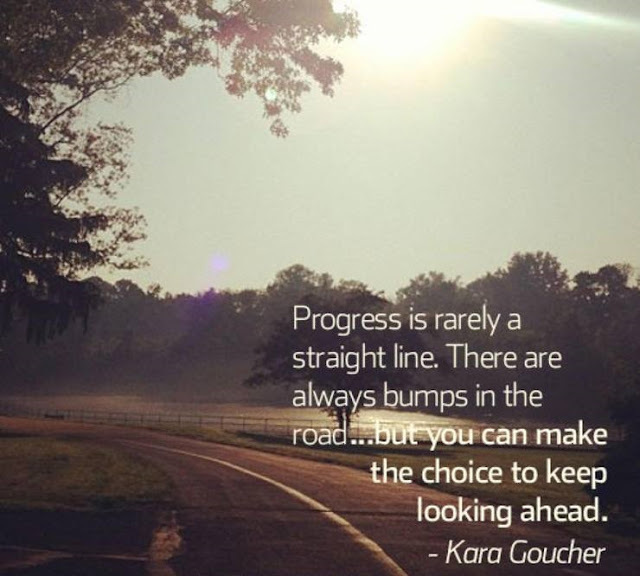 That is where I found this quotation from Kara Goucher. I just need to remind myself that this is just a bump in the road, and that I just need to keep moving forward.